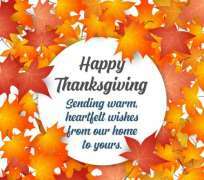 The American Human Rights Council (AHRC-USA) wishes all Americans a happy and blessed Thanksgiving holiday. The first Thanksgiving was celebrated in 1621 with a meal shared by the Pilgrims and the Native Americans. Thanksgiving is celebrated every year on the fourth Thursday in the month of November. It is commonly celebrated with family meals with friends and family getting together to share food and give thanks. "Thanksgiving is a time to give and share thanks and love with friends and family," said Imad Hamad, AHRC Executive Director. "While we enjoy our time with friends and family over a nice meal, let us not forget about our fellow human beings, the less fortunate among us here and abroad," continued Hamad.